Thanks to dental implants in Longmont, you have a brand new smile you can be proud to show off. These pearly whites may be artificial, but they look and feel just like your natural teeth. In order to keep them healthy and strong for decades, you need to commit to taking care of your new teeth. To help you get started, here are 5 ways to properly maintain your dental implants. These fixed devices require very little maintenance, so adhering to your normal dental hygiene routine is a great way to keep your dental implants clean. Make sure to brush twice a day for two minutes, floss at least once a day, and use an antiseptic rinse to thoroughly remove any bacteria or food particles hiding in the crevices. It’s also important to continue using a fluoride toothpaste to ensure your natural teeth don’t develop cavities or tooth decay. If nearby teeth begin to deteriorate, bone loss could become a factor, which can affect your dental implant if it’s next to a loose or missing tooth. During your normal six-month checkup, your implant dentist in Longmont will not only clean your teeth but will also check your restoration. This is to make sure it is still in pristine condition and there are no causes for concern. Poor oral habits can cause bacteria to grow around the gum line and lead to gum disease. If it progresses into a more advanced stage, it can cause bone loss and your implant may fail. Some dentists may not suggest dental implants if you are a smoker; however, if you are still able to receive the restorative treatment, you should quit smoking to prevent shortening the lifespan of your dental implant. Smoking can cause your body’s immune system to weaken, which means you are less likely to heal quickly. This inability to heal means the implant cannot fuse to the bone, resulting in implant failure. While dental implants give you more freedom than other tooth restorations (dentures), eating hard foods is something you should avoid, if possible. Chewing on ice or eating hard candy can result in a cracked or broken crown, damaging your implant and creating additional restorative work for you and your dentist. Just because your new implant cannot decay doesn’t mean you can eat all the cookies, ice cream, and candy you want. If gum disease develops because of plaque buildup (as a result of too much sugar), it can damage the bone structure and cause your implant to fail. Ensure the longevity of your new teeth by taking proper care of them from the beginning. 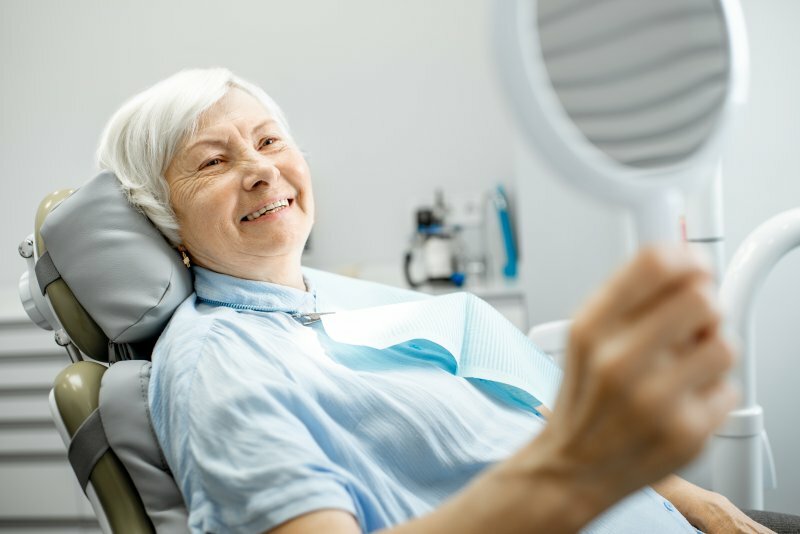 If you have any questions about your dental implants and how to keep them looking their best, don’t be afraid to talk with your local dentist.